I suggest dividing and conquering the work of unpacking and organizing all the stuff AND installing and fixing all the things. You can’t really multi-task while moving, it just slows you down. I try to move the boxes to the correct room or area of the house first, and then open the box up and find a place for each item. This is a lot easier using my color coded duct tape system that I wrote about here. Sometimes the place is a temporary home, like my DVDs are in a basket and shuffling around the room until we figure out where we are installing our TV wall mount. If you’re living with a partner or have help during a move, you can assign the assembling to one person, and the unpacking to the other. In my case, I’m the unpacker, and Nick is the builder/fixer. This would work fine solo if you divide your time between the two tasks, like putting together your bookshelves and then unpacking your books. I find that I can be more efficient if I work on one area of the house at a time. Paper towel holder, towel rods, bathroom hooks, natural DIY cleaners and soaps—these are just some of the things I ordered/installed/made this weekend so that living in my new home would be pleasant. Don’t put off buying essentials like curtains if you have no privacy. Don’t settle for putting your dirty clothes in a garbage bag just because you can’t find your laundry bag, go out and buy a new one! The worst part of moving is feeling unsettled, and it doesn’t take a lot of energy or money to inject comfort into the process. Go to bed at a decent hour or sleep in if you can. Moving and unpacking is hard labor on the body and you need to recharge. Make sure you have access to decent tasting water—it’s okay to buy bottles if you don’t want to drink from the tap or the funky fridge water. We made sure to find our Brita filter quickly, and we have plans to buy a reverse osmosis system soon. Take appropriate breaks for snacks and meals. I tried really hard to limit eating out, because you know, moving is very expensive! But twice I failed at having meals at home because I really wasn’t prepared to cook. It’s okay, fast food is there for a reason, and luckily my mom is still letting us eat dinner at her place until we’re more settled. 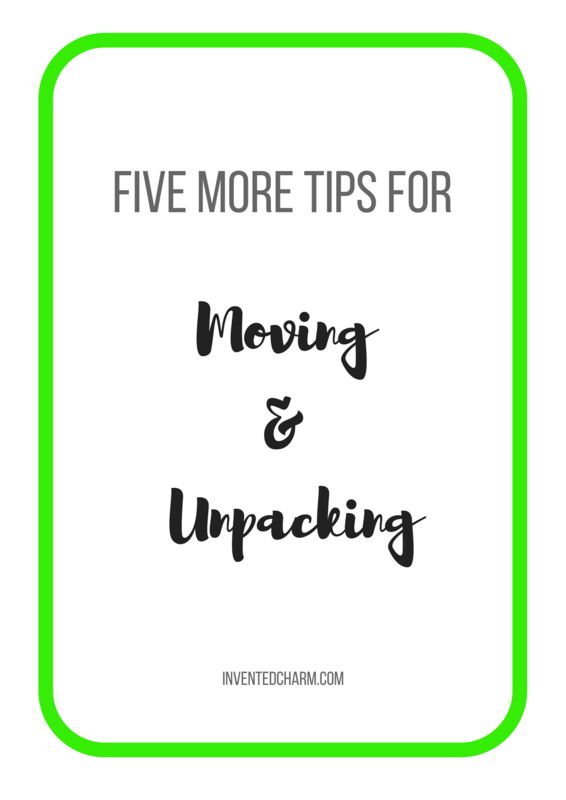 Moving is stressful, so try to maintain your normal schedule if you can. Nick is working and only took a half-day off work to move. I’m still writing on a Monday because I’m trying to be more committed to my editorial schedule. If all you do is unpack and worry about moving in, you’re going to burn out. Make sure you’re scheduling fun stuff too. Unpacking boxes and doing housework can be really monotonous, so you need to schedule some time off. On Friday afternoon I had a play date with Rory. On Sunday we worked on our house until 3 PM and then headed to my parents’ place to swim and celebrate Father’s Day. In the evenings we unwind with a TV show and a cocktail. Eventually, every last box will be unpacked, and who really cares if it takes a few extra days? Nick and I set up a budget for getting the Tudor household started. I think we are on track, even with a few financial setbacks. It’s all about looking at those line items, and cutting things out as your balance dwindles. I had allocated quite a bit to window coverings and rugs, but after a really expensive trash hauling bill after demoing the carport and covered patio, I decided to spend half as much and stick with Ikea curtains and rugs in some of the rooms. Ideally, we wanted to hire someone to come grind out the tree stumps in our backyard, but now Nick is looking at DIYing it. The other option is to put off making purchases until you have more money to finish a project. Right now the master bedroom is a disaster. I need to make the walls an even texture, fill and patch a ton of holes, and paint the whole room. So until I complete that project, I’m going to hold off on buying rugs and a new bed that we desperately need. This is more for my sake, but here’s a run down of the projects we’ve already finished or will finish this week. Keep in mind that we’ve been in possession of the house since May 5, and we have had several weeks to work, as well as some labor supplied by family and friends. We learned in our last home that it’s easy to lose steam if you don’t have a real plan when you move in, so this time around we are using Trello to keep our household projects organized. Are there any projects you waited to do but wish you had tackled soon after moving in?